Bartlett’s booth at the ISA Conference, a place to network, learn about the company, and exchange ideas. This past August I had the opportunity to attend the International Society of Arboriculture annual conference in Milwaukee, WI. This is one of the few times throughout the year where you gather with other like-minded folk who have a passion for trees. There were a few sessions I attended during the conference that I thought were insightful and informative. Dr. Michael Joseph Raupp from the University of Maryland had a great presentation on the non-target effects of insecticides. In recent years there has been a lot of discussion and research around neonicotinoid insecticides used in urban landscapes and their impact on beneficial insects. Neonicotinoid insecticides are used by arborists to help suppress pest populations such as aphids, leafminers, Japanese beetles, and psyllids to name a few, who damage valuable ornamental trees and shrubs. When this product is applied in the landscape, arborists and the public are interested in the impact this has on beneficial insects such as honey bees. One study Dr. Raupp presented at the conference discussed residual activity of neonicotinoid products in plants and if these neonicotinoid compounds were found in honey bees foraging on plants that had an application. The study concluded neonicotinoids do not pose a threat to honey bees. The Climbers’ Corner, with several different speakers over two days, served as a good reminder for the fundamentals in tree climbing. Increasingly tree climbers are being recognized as athletes due to the daily activities of work positioning aloft, ascending the tree, and rigging. It is becoming ever more critical to have tree climbers practice proper techniques to limit injury and promote the longevity of their climbing career. I thought Treemagineers from Basel, Switzerland did a good job discussing different ascent techniques and comparing them to the secured footlock. I attended a presentation by Don Picker and Dr. William Fountain on the development of arboriculture in Asia. Picker helped establish the Institute of Arboriculture Studies-Hong Kong, coordinated the publishing and translation of the first ever Chinese 1st edition Tree Climbers Guide, and is the CEO of Asia Tree Preservation Ltd. This presentation made me realize how arboriculture practices in the USA are not practiced universally across Asia. In much of Asia, arboriculture is a foreign practice and requires a lot of introductory education on the profession. I strongly encourage anyone who has a passion for trees to attend next year’s ISA conference. Those who attend the conference will help their firms benefit from better buyer-seller relationships, enhanced cooperation and exchange of ideas, improved productivity, reduced costs, and innovations. 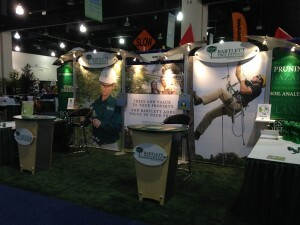 No wonder Bartlett Tree Experts had a very large presence at the conference.